This month we celebrate Nesta’s 20th birthday. Here I share some thoughts on where we’ve come from, where we are now, and where we’re headed. Reinventing what ‘good help’ means in healthcare. There are many others. All are examples of using innovation methods to achieve a common good. And all are meant to spark and catalyse change on a bigger scale. Although we have good reach, whether through our many dozens of investments; the 850 plus grants we’ve made to more than 680 recipients this decade; or the one million plus people each year who visit our website, we’re still a relatively small organisation – certainly far smaller than the biggest UK funders, let alone the US foundations, and we're a small player in the struggle to put right a huge imbalance in how the world organises its brainpower - an imbalance which means that innovations are far more likely to be funded if they’re in the military, or marketing, or finance than if they’re for a social purpose. So to amplify our impact, we don’t just use income from our own endowment but also use a steadily growing income from others: big firms like Google and Tata; international bodies like the UNDP and the European Commission; national governments from the US to India, Canada to Singapore; and foundations, like the Robert Wood Johnson Foundation in the US. And to amplify our impact, almost everything we do is a collaboration with others. So how did we get here? Why are we doing these things now? And what will we do next? When Nesta was formed in 1998, it was given a remit to promote and stimulate innovation, to help commercialise ideas and intellectual property, and to make the case for creativity. Back then, the big concern was that the UK wasn’t doing enough to capitalise on its creative talent. That led Nesta in its early years to back lots of creative individuals, and projects of all kinds (ranging from the brilliant to the slightly mad). Many of the people that were backed then have gone on to great influence – in theatre, technology, games and many other fields. And many early projects look prescient in retrospect – like investing in the early driverless vehicles (now in use at Heathrow); developing new measures of intangible capital; or pioneering new challenge prize models to cut carbon emissions (in the Big Green Challenge). But much has changed since the late 1990s. The word innovation is everywhere and doesn’t need much advocacy. The creative economy has grown fast, brilliantly measured by colleagues here at Nesta – and now employs some two million people. London is a buzzing global city and other big cities across the UK have a big presence on the world stage and lively start-up scenes. Venture capital has hugely expanded with a wave of billions coming in over the last few years, mainly from the US. Universities and governments have invested heavily in technology transfer and there’s broad support for the government’s commitment to a big rise in the share of GDP for research and development (to 2.4%), much of which will be spent by our new neighbours in UKRI. We can’t claim that none of this would have happened without us. But Nesta played a significant part in this shift in culture and priorities. That very success means that our role has had to change. There is much less need just to advocate and promote innovation. Instead the big question now is not whether to innovate but what kinds of innovation we need. Although the global cities are booming, the benefits have not spread down or out. Large groups have been bypassed and live with stagnant pay and precarious work. Most innovation policies assumed the benefits of growth would trickle down. They didn’t. And many of the big social challenges got worse, not better. That’s led to three shifts in how we work. The first is a stronger emphasis on kinds of innovation that aren’t just about hardware and stuff – service innovation, social innovation, user-driven innovation – and showing how in fields like healthcare they can often deliver the best returns. The second is a shift towards making the knowledge and creative economy much more inclusive. It’s still vital to advance the frontiers – in fields like immersive tech or AI. But if there isn’t just as much attention to spread and adoption to smaller businesses and places far beyond the big cities then inequalities will only widen. The third is a shift to a more critical view of innovations themselves. Social media platforms are great – but not if they leave teenagers unhappy, if data is harvested against our interests, or if fake news undermines democracy (no wonder they were called the ‘new tobacco’ earlier this year: addictive and harmful). AI has huge potential benefits – but people are right to be worried that it could destroy more jobs than it creates or disempower us in daily life. So it’s no longer credible just to be in favour of innovation – instead we have to ask serious questions about what kinds of innovation will create the greatest value for the greatest number. Nesta’s shift from being a government-controlled quango to being an independent charity in 2012 makes it easier for us to respond. Our legal status as a charity forces us to act in ways that deliver public benefit. But we’ve perhaps been slow to really emphasise that, to sharpen up our mission, to make our communications crisper, and to be clearer about our moral purpose. We went on too long advocating innovation and creativity in general, rather than being clearer about what kinds of innovation we want to promote. That’s something we’re now working to change. … and in sister organisations that we’ve invested in we have expertise in how to use behavioural science (BIT) or digital tools (Futuregov) or procurement (Citymart). At our best we bring these capacities together to shift systems rather than only backing individual projects. Over several years we promoted computer science and coding for children, because too many were leaving school and university unprepared for how jobs were changing. We persuaded the government to add computer science into the curriculum, funded thousands of clubs for children to join, and worked with big companies and the BBC to make free tools and courses available online. We contributed to a sea-change in how health services are run to address the needs of ageing populations with more long-term health conditions, promoting what we call ‘people-powered health’, where patients are mobilised to support each other and use digital technology to manage their health and avoid unnecessary crises. Again we’ve done this through research, advocacy, funding dozens of organisations, and showing in practice how local health systems can be organised in radically different ways that improve outcomes and save money. Many of these ideas have now been absorbed into government policy, and thousands of lives have been touched for the better. We’ve helped grow an alternative finance sector – backing ideas around peer-to-peer lending and crowdfunding that offer more agile alternatives to traditional bank lending for entrepreneurs with good ideas to get off the ground. Again we’ve acted partly as a funder and investor, partly as promoter, and partly analysing this new field through annual surveys which showed the sector doubling in size each year to well over £3bn by the mid 2010s. We did the same with impact investment – promoting new methods and showing how they can work in practice through our own funds; growing the field of social innovation that’s now gone mainstream all over the world; and showing how the sharing economy can be shaped to tackle social problems and create jobs. 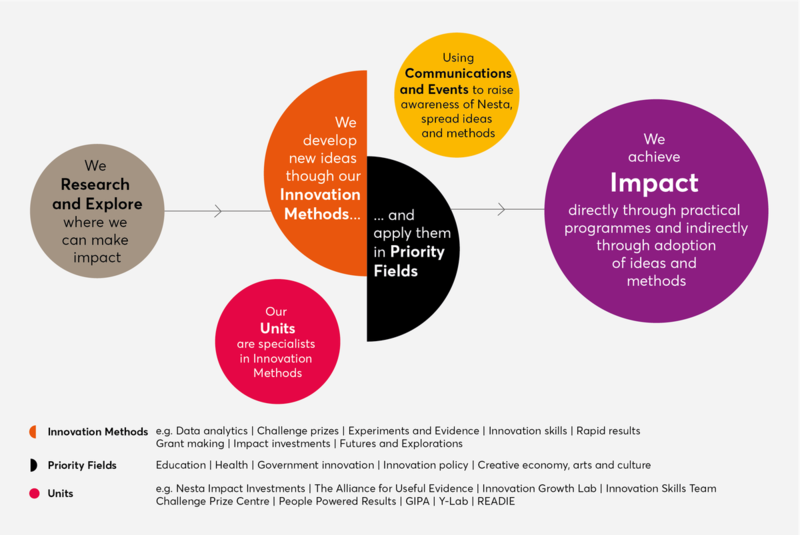 This strength in expertise – in the methods of innovation – is embodied in the people who work at Nesta and is applied to fields we see as particularly important. But it’s also shared and distilled in useful guides and toolkits (like the DIY Toolkit that has had over 1.5 million users and been translated into many languages, or the one we’ve just published on how to use finance). It gives us a unique capability to be useful to others, and I’m certain that this skillset is central to our future potential. Not everything we do works. We don’t have the luxury to target a 90% failure rate (as DARPA does in the US). But we do take risks and sometimes things fail. We didn’t manage to create a new field of hyperlocal media in every neighbourhood as we’d hoped (the advertising pull of Google and Facebook was too strong); and I still don’t know why in an earlier period Nesta funded a ship full of poets to go to the Arctic. But overall we’ve had a pretty good hit rate, and when things don’t go to plan we work hard to learn the right lessons. Nesta began as a classic foundation, making grants from its endowment. Then in the 2000s Nesta shifted to using more of the endowment to back investment in ventures and our own research. In this decade we decided to change further, using our independence to become less like a traditional foundation or government department, and to apply innovation methods and thinking to our own work. We became more experimental; more entrepreneurial; more outward looking. We encouraged units and teams to grow, finding sources of revenue and partners. We aimed to be world class not just good in the UK. This shift has worked well. Our units like the Innovation Growth Lab, Innovation Skills, States of Change, the Alliance for Useful Evidence, Readie, Nesta Impact Investments, Challenge Prize Centre, People Powered Results and others have grown and achieved global reputations. We are three times as big as earlier in the decade both in staff and turnover. We’re seen as dynamic, fast moving and high quality – as good at much of what we do as anyone else in the world. But this growth has come with some costs. At the end of 2016 we moved into our new building in 58 VE – which has been a great success practically and financially. But we’ve quickly outgrown our space. The very range of what we do – from backing start-ups to saving whales in Canada to training civil servants in Sri Lanka, funding hospices in London to homelessness projects in north Wales to supporting startups – can make it hard to communicate what we’re about. What then of the future? We have a unique freedom to act long term. At our best we operate in the space between short-term action and the very long term. So within each of our thematic priority areas we have clear three-year goals, but situate these within five to 15-year goals and challenges. How to prepare young people for a world of pervasive automation and AI? How to help people really control their own data? How to transform healthcare so it truly is people-powered? So we will have to fight harder and assert our mission more strongly: recognising that many of the promises made for technology, globalisation and progress weren’t delivered on (which is why so many people are angry), but showing how to put that right in progressive ways rather than trying to retreat into the past. Our public-facing values, which were drawn up by a group of staff a few years ago, make this easier: a healthy restlessness that avoids complacency; the bias to action; being a good collaborator; a commitment to ethics and being willing to air the tricky challenges – like whether take money from a suspect source if think can do real good? 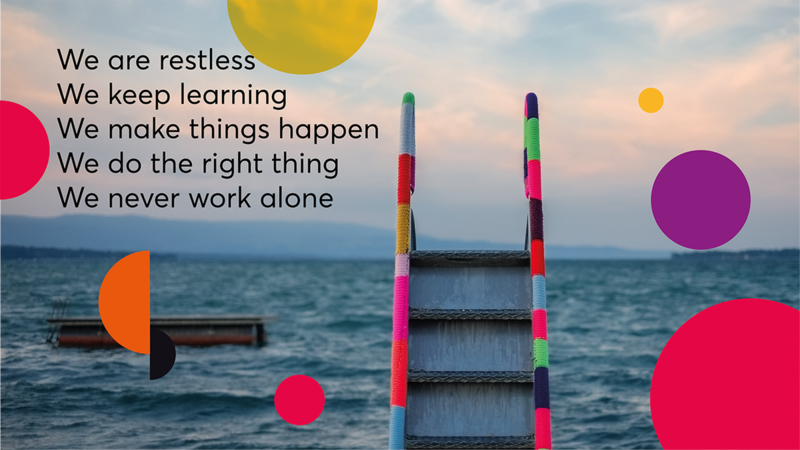 And above all a commitment to learning from both success and failure. 20 years on there’s still a job to be done promoting creativity and openness to new ideas. But the even bigger task we’re part of is to shift the world’s innovation systems to better deal with the challenges that really matter – ageing, unemployment, distrust, poverty – at a time when too many of the best brains are either trying to come up with better ways to kill, or better ways to get clicks, and when so many of the institutions with power or money are either becalmed or going in the wrong direction. That’s a serious task and we may well fail. But I hope we can also retain a lightness as we move into our twenties. Bernard Shaw was surely right when he wrote that we don’t stop playing because we grow old. We grow old because we stop playing. Thank you for sharing Nesta's story and congratulations on this great work. I really enjoyed reading it.